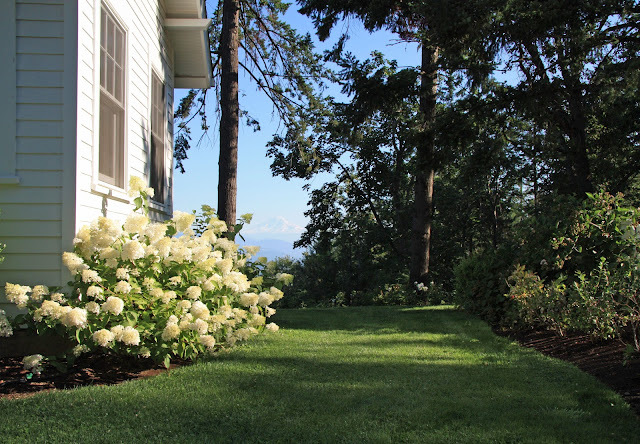 The north-facing hydrangea bed whose blossoms I highlighted last time does get direct afternoon to early evening sun. During the hottest days, the blossoms will wilt by the end of the day. On these days, I'm sure to give them an extra drink of water and thankfully, they do recover just fine. I received a lot of inquiries after the last post regarding which mountain we see in our north view. It is Mt. Adams, which is located just across the Columbia River from us in Washington state (we are in Oregon). The trailheads which lead up the mountain are about two hours drive from our porch. The ridges which you see in the middle of the frame are also in Washington state. The state line runs between the farmland in the foreground and those riges, along the deep canyon of the Columbia River Gorge. The Little Lamb hydrangea are doing well this year, their third growing season. Their blossoms are very similar in shape as the Limelight, but are much more creamy in hue. Even though they do receive lots of morning to mid-day sun on the east side of the house, they do great. I chose this variety because they are more sun tolerant than a lot of the other hydrangea varieties, who prefer mostly shade. So far, I haven't really been able to figure out how to better capture the mountain with my camera. It always seems to end up washed out. Bombshell hydrangea are proving to be a good choice for this south-facing bed. They receive full sun and fare very well, even through the hottest days. I planted these last spring (five bushes). I look forward to when they grow even taller and create more of a singular-looking hydrangea plume under the dining room windows. The property your house sits on and the views you have are like looking at a vacation magazine! Seriously, you are LUCKY!! What a beautiful view you have!!! wow!!!! I am a bit jealous! These hydrangeas are beautiful! We used them in our wedding and they are one of my favorite flowers. I absolutely love your blog & photos. I live about 100 east of you where it's much drier. I so enjoy seeing the green in your area! You are living my dream. We have lots of family in Washington. I am from Southern Calif. We are looking to do the same thing soon. Oregon seems perfect, between both sets of friends and family. I just worry about the weather. Is it gloomy too much? I didn't realize how spoiled I am here. Going back East recently, taught me that here in Sunny Cal, we never give the weather a thought.....So glad I found you. Beautiful, beautiful, beautiful house and scenery! those are beautiful trina, as is your view. when i was a kid our neighborhood had hedges and hedges of hydrangeas, they grew like weeds near the ocean. now they are v delicate and need lots of shade. it's a miracle any grow at all. i have the same problem with trying to catch the mtn view from my porch. yours came out great though. Your home and view are simply breathtaking. We are east of the Cascades so we get a lot of sunshine. We do have our fair share of rain of course, but we like the variety. OH! What a piece of Heaven you are ensconsed in. And then... add prolific hydrangeas to the mix. Heaven indeed! It's like you have your own little slice of heaven! You've done a beautiful job with your landscaping! We've just planted our 2nd limelight in front of our porch in Maine, so far the 1st one is doing great in the south facing sun! Your hydrangeas are beautiful, and oh my, what a wonderful view you have! I've been reading your blog for a little while now and thought I should stop stalking and say Hi! You have a beautiful house and garden. Thanks for giving details of the plants you are using, very helpful in trying to chase them up over here. Trina, you live on such a magical spot!!! I used to live in Oregon and absolutely loved the scenery. I miss the mountains, but not the rain! My hydrangeas are not fairing well this year with the heat we've been having here in Maryland, which is a bummer because they're my favorite flowers in the summer. I love all of your varieties and think I may add some to my garden next year. I am still as stunned by your view as I was the first time I saw one of your photos of it. And the hydrangeas are beautiful. There is nothing I love more in the garden. The hydrangeas are all so beautiful, but I am in awe of your view...breathtaking!! 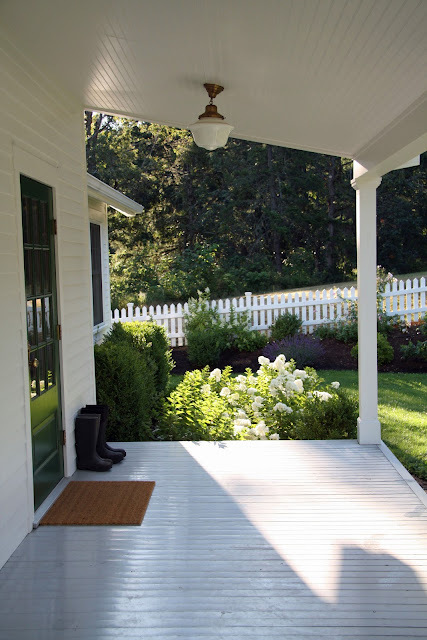 Such a gorgeous view, love your porch with your wellies! The views from your home always take my breath away. They are amazing. Your hydrangea plants are doing so well! If you are ever in need of another variety that does well in full sun, I might suggest Pink Diamond. I have found them to be hardy, reliable and very pretty. Your grass is so beautiful and green! I am so jealous of your incredibly beautifuly hydrangeas. Your climate is very helpful for growing them. Your scenery is so awesome, you wouldn't need to leave to feel like you're on vacation. What gorgeus views. I've been thru that area with hubs in truck so know how pretty it is there, that whole area up thru Washington also. Wish we could travel that way again but hubs not trucking anymore. I used to have relatives in Oregon and Washington so had been able to spend some time in both states. I treasure the memories of those trips and times spemt there. I can remember strawberries aunt/uncle grew, lot bigger than what you can buy. That view is so pretty it hurts!! Fabulous. I am loving both my Little Lambs and Bombshells. They take the heat and sun so well. I'm super impressed with them both. And, I'm only on year one and just planted so can't wait to see what they do next year! Trina, your view is unbelievable! 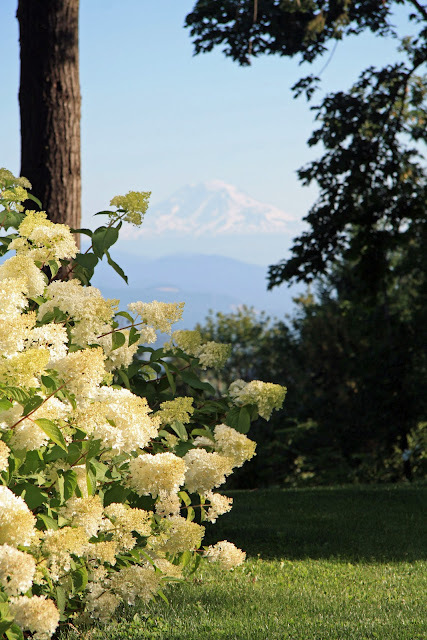 The hydrangeas alone would be breathtaking but to look beyond and see those mountains--It's like a movie set! Look forward to reading through some more. We lived in Portland , Oregon, for almost 2 years before moving to Argentina. I loved it there, it is such beautiful in the PNW ! Your place is stunning! I wonder, do you ever have deer to contend with? The fence I see is short and wouldn't deter, unless you have something else at the perimeter? You have the most amazing view and home. Just discovered your blog and love it! I love hydrangeas -they are my favorite- and yours are always so beautiful! It's nice following a blog that lives nearby - we live about 45 min north of Portland in Washington. I've followed your blog for a little over a year now and have enjoyed it immensely. We have a 9 month old daughter who we are trying to raise in a very similar manner in regards to green living: organic baby food, green toys, etc... It's nice to know that there are other like minded people out there, so thank you for sharing your experiences! :) Oh and by the way, your home is beautiful!! We don't have any barriers to keep deer out. They basically have the run of the gardens. Fortunately, they haven't been too much of a problem. They nibble on the hedge roses out back and they like the blueberries but they leave everything else alone. Knock on wood! I seriously wish I could crawl through my computer and visit you! The views, the hydrangea the lush grass oh my!!! LOVE all of your hydrangeas! I've become quite the collector of hydrangeas since we moved to our present home 7 plus years ago. Your view of Mt. Adams is fabulous! In our prior home we used to have a view of Mt. Baker (in northern Washington) and now have to traipse to the back of our 20 acres for a still wonderful view of it... I found that, at least here, to get a clear picture I need to take it in the winter or spring when the snow pack was heavier... much clearer photo. Perhaps the warmer weather and less contrast between sky and mountain is why it seems washed out? Your home is truly beautiful! 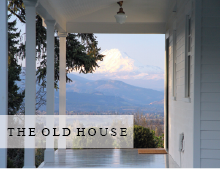 You have done amazing things with that little farm house! 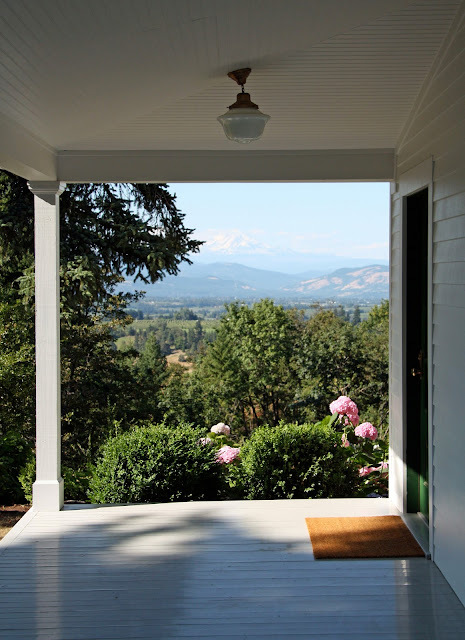 From the porch, to the white picket fence..to that VIEW! Wow...dream home for sure! God Bless and enjoy that wonderful home you've created!!! I can't wait to follow along and see what else you do! Living as I now do on the prairie, I sometimes ache for mountains. I grew up in the shadow of Rainier further north up the chain near Tacoma and was living in Portland when St. Helens blew up. I always lived on the wet side of the mountains, but no matter, I loved the rain, and fog, and mild winters. Your lovely photos tug at that part of me that wrestles with the "bloom where you're planted" part of me. Sigh. Your hydrangeas are beautiful. My absolute favorite! Your home is amazingly beautiful Trina. So pleased you named those Hydrangeas as I was wondering what they were. thank you. You have a very gorgeous home with a gorgeous view! 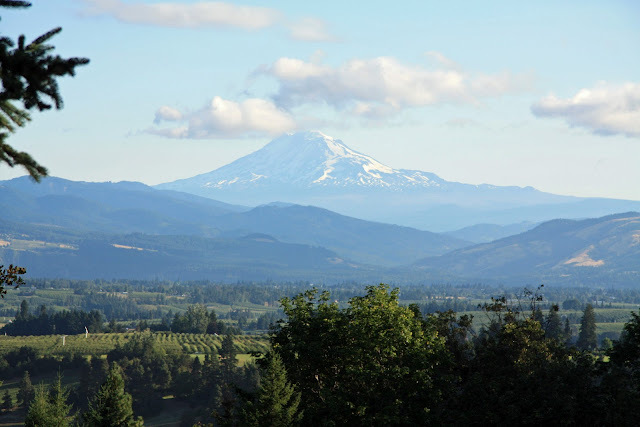 We are blessed to look out our window and see Mt Rainer in the near distance! I love living in the NW!!! Your issue with the mountain always being washed out in your photos is natural given it's distance from your shooting location and the wide range of light between foreground and background. Some of the haziness is just in the atmosphere, while other parts are contributed to the dynamic range of your camera. You do have a bit of shadowy areas in this image that your camera will adjust for with auto exposure using it's built-in metering system. While a shorter shutter release will darken up the light areas, it will also darken the already dark areas and make your photo appear underexposed; not a better scenario. it's an issue of dynamic range - ie the degree of range between light and dark your eye can see is much wider than the camera can actually capture so often in high contrast scenes (such as you posted with a very bright background) you overexpose the brightest areas and wash them out. Possible fixes to this problem could be resolved with postproduction software, such as Photoshop. You may also find a benefit in using a polarizing lens filter. Good luck. I was Googling snowball hydrangeas and stumbled upon your blog. What a beautiful and serene lifestyle you appear to live. Enjoy the view!